Although I, like many, always associate the beginning of Fall with Labor Day, (and an associated drop in the temperatures), it officially arrived yesterday—a development I find very pleasing. I like summer in the theoretical sense: that is in January summer is very appealing, but the arrival in June of hot, humid temperatures always dampens my appreciation for the season. Surprisingly this summer, I managed to knit through quite a bit of the uncomfortable days. I discovered if I sat just so in relation to a ceiling fan, I could usually knit contentedly. I had hoped to have at least one new shawl finished fir the start of fall. Rock Island, at least. Instead I have three partially completed shawls. But since one is approaching the finish, one is to the last section, and one I just enjoy a bit too much to care, I’m not disappointed. If you recall, Rock Island was being employed as an “incentive” knit. I hit my goals for the other two shawls, which should have allowed me to start the lacey mid-section of Rock Island, but I was sucked in by the new chart for Swan Lake. After completing the main section (my goal) for Swan Lake, I looked ahead and noticed that the “wing” is attached similarly to a knit-on edging, only instead of a short repeating pattern, it grows every other row in a triangular manner. It seemed that it would be quick enough to get through the first chart of this new section, so I started. Then decided that I might as well finish off the thing while it’s on the top of the work basket. I’m approaching the end of this one (although it’s starting to drag as the rows get longish), so Rock Island waits. With the change in seasons, sweaters are beginning to call out my name (this usually starts in August, but I was determined to make progress on the lace this year), so I might turn that direction next, but I would like to get Rock Island finished as well. 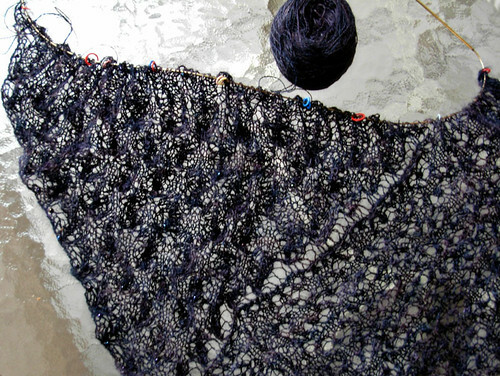 As for my third lace of the summer, Aeolian: it might just have to wait for a while. The rows are a bit too long right now to encourage me that direction. Mmm….that finishupitis sounds pretty compelling at the moment. Lace charts are like chapters in a good novel. You always want just one more. I love, love, love the colors in that lace. I can only just barely see the pattern, but I can tell that it’s going to be beautiful!